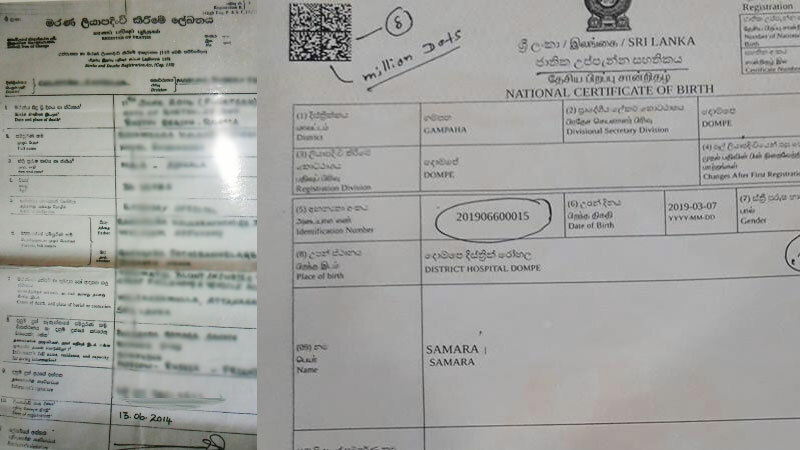 For the first time in Sri Lanka, the Registrar General Department announced that it would take steps to computerize birth, death, marriage certificates and title deeds whilst also issuing it to the general public through a one-day service, Minister of Home Affairs, Vajira Abeywardena said. “This move would greatly reduce the incidents of corruption and illegal means that people have used over the many years to forge and obtain documents,” he said. The minister said that this service would initially come into effect in the Western and Southern provinces and would be followed by the rest within this year. He added that these certificates will also be available electronically and this would ensure that there are no duplicity and that an individual’s status quo is updated periodically. “The Pensions department, ID, passport office, registrar department would be linked to ensure that all departments have access to these documents so to assist in ensuring that citizens are afforded a speedy and hassle free service.” He said. The issuance of title deeds which will also be available electronically is to be launched under the patronage of Prime Minister Ranil Wickremasinghe at an event on March 16th at the Registrar General’s Department. Minister Abeywardena also added that the Registrar General’s Department is intent on increasing its revenue from Rs 800 million to Rs.8000 million by the end of this year. He also said that birth, death and marriage certificates will now be trilingual which would make it easy for it to be furnished without having it translated. The certificate would also bear the national emblem so to ensure its originality and that it cannot be duplicated. “Those who have already obtained certificates will receive the new one upon request,” he said.